Tag line: "A Half-Human Monster Stalks The Jungle!" Set in the dark regions of Africa, 1945’s White Pongo follows a team of explorers, including Sir Harry Bragdon (Gordon Richards), Sir Harry’s daughter Pamela (Maris Wrixon) and hired Rifleman Richard Fraser (Geoffrey Bishop), as they attempt to track down a white gorilla, which they believe to be the missing link between mankind and his primitive ancestor, the monkey. With the help of their guide, Hans (Al Eben), the expedition reaches the area where the gorilla, named White Pongo by the natives, was allegedly spotted. What they don’t realize, however, is that White Pongo himself is already nearby, watching from a distance as the group makes its way deeper and deeper into forbidden territory. To describe White Pongo as “standard fare” is something of an overstatement. In fact, many of the usual plot points that go hand-in-hand with this sort of movie are here for the taking: explorers trekking into uncharted areas to try and locate the “missing link”; an uninspired love triangle; stock footage of monkeys and huge lizards in their natural habitat (to lend the picture a little authenticity); and the title creature itself, which, aside from a couple of attacks (one at the beginning of the movie, when he kills a native, and another towards the end), doesn’t do much but hide in the weeds and watch the expedition as they canoe down the river (which they do quite a few times over the course of the film). 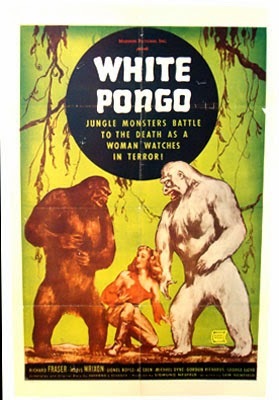 While it does make some attempts to distinguish itself (there’s a twist around the halfway point that, to be perfectly honest, I didn’t see coming; and a showdown between White Pongo and another gorilla isn’t without its thrills), White Pongo doesn’t offer fans of black and white adventure films anything they haven’t seen before. White Pongo isn’t a bad movie, per se. But it is an unspectacular one.